Who is he? 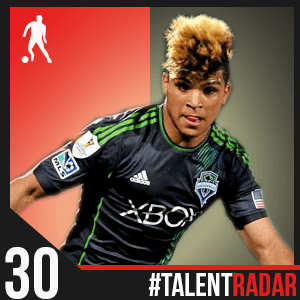 Yedlin is a 20 year old right back playing for the Seattle Sounders in the MLS. He is yet to be capped for USA. Back in 2013: Yedlin is a regular for the Sounders having featured 30 times in the MLS for the Sounders in what was his first season with the senior side. He scored once in 2013 in the league against the Colorado Rapids and also managed an assist against Real Salt Lake. He started 30 times for his club and country. He also started in 3 out of the 4 games in the CONCACAF Champions League. Yedlin was a part of the unsuccessful U-20 World Cup team for the USA. He’s never made a senior appearance for the national side but he’s one of the 26 who’ve recently been called up for a USMNT training camp by Jurgen Klinsmann. Looking ahead to 2014: After having finished 3rd in the MLS Rookie of the Year voting, 2014 will be a big year for DeAndre Yedlin. His immediate goal will of course be to impress boss Klinsmann in the training camp. Whether he can book a place in the 23 man squad only time will tell but he’ll want to take the chance to impress. After that, it’s all about kicking on in 2014 and building on his first season with the Sounders. Who is he? 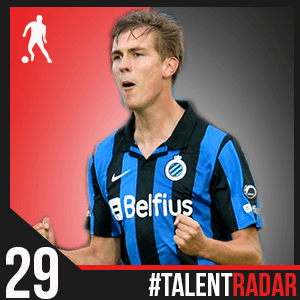 Bjorn Engels is a 19 year old defender who plays for Club Brugge in the Jupiler Pro League. The Belgian centre-back has the quirky distinction of having scored an own goal on his club debut in the Europa League and a goal on his league debut for Brugge. Back in 2013: Engels made his league debut for his club in the 2nd game of the season and marked his debut with a goal as Brugge overcame KV Oostende by a 2-1 margin. Engels has since started 13 other games for the Belgian club and added to his goal tally in a 4-1 loss to KV Kortijk. He has managed to garner 5 yellow cards and a sending off in his short league career thus far. The tall centre-back hasn’t managed to make his mark at the International stage yet with a solitary appearance in an U-19 friendly in 2012 being his only appearance in International football so far. Looking ahead to 2014: Engels has enjoyed plenty of first team football for his club this season and he would definitely be looking forward to the restart of the League after the winter break. Engels would be best served furthering his development at Brugge in 2014.
Who is he? 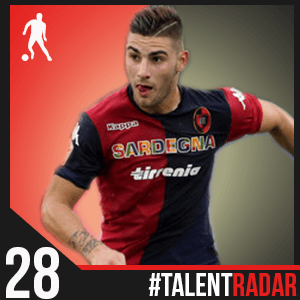 Murru is a 19 year old defender plying his trade for Cagliari in the Serie A. He’s a left-back who’s featured heavily for Italian teams at various age groups. Back in 2013: Having made sporadic appearances for Cagliari previously it was towards the end of the 2012-13 season when Murru started enjoying a regular run in the first team. In fact starting from March, he featured in 9 out of last 11 fixtures of the season missing one due to suspension and the other due to an injury. He has continued in much the same manner in the present season starting 12 times thus far including the first 3 games in which he registered an assist in every outing. The left back was a regular fixture in the U-19 side last season in his regular left back role and also a couple of appearances as right back. Looking ahead to 2014: Murru has established himself as first choice left back in Italy and is reveling as first choice for his club. After featuring heavily for the U-19s, he’ll be looking to break into the U-21 set up and eventually the senior side. Who is he? 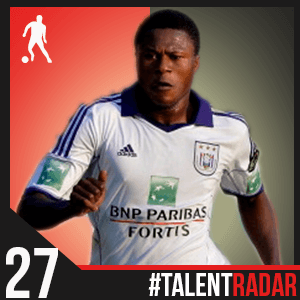 Chancel Mbemba Mangulu is a 19 year old (we think) defender who plays for Anderlecht. He has already featured at senior level for the Democratic Replublic of Congo. Back in 2013: After moving from ES La Grace, a club in Congo to Anderlecht at the start of the season, Mangulu has enjoyed his spell in Belgium and has already made his presence felt in Belgium, certainly enough to make this list. He started the first 2 games of the season before being briefly left out of the starting XI. He won back his spot soon and has thrived at Anderlecht. He’s made 16 starts in the league including featuring at right-back on a couple of occasions and started 5 out of 6 games in Anderlecht’s ultimately disappointing campaign. He’s shown that he carries a goal threat chalking up 3 goals in the league and 1 against Benfica in the Champions League. Mangulu has already made a handful of appearances for Congo and should continue to be a regular fixture for them in the years to come. Looking at 2014: Anderlecht capped off 2013 with a good win against Zulte-Waregem and find themselves in 2nd spot heading into the new year. Mangulu will be keen to continue impressing and help his club catch up with Liege atop the league. On a personal note, Mangulu has placed himself on the map and interest from some of the bigger leagues wouldn’t surprise us. Who is he? 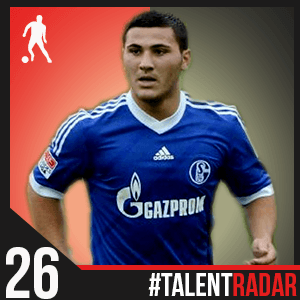 : Sead Kolasinac is a 20 year old left-back who plays for Schalke in the Bundesliga. The German-born defender has played for Germany at various age levels before accepting the offer to play for Bosnia and Herzegovina at the senior level. Back in 2013: The year 2013, at least the first half, will be one that will be fondly remembered by the young left-back. After a couple of appearances in the 1st half of the 2012-13 season, it was in 2013 that Kolasinac was given a run in the starting XI. He played in central midfield in Schalke’s first game of the calendar year in a memorable 5-4 win against Hannover. He was a consistent fixture in the side from then on, featuring at his more customary left-back position. The 2013-14 season though has been a frustrating one for the youngster with an injury plagued start to the season. He had to wait till the end of October for his first start of the season and has been eased back into the starting XI. Kolasinac was a regular fixture for the German youth teams but as mentioned before, he’s decided to take up the opportunity to play for Bosnia-Herzegovina and played the entire 90 minutes in a friendly against Argentina in November. Looking to 2014: The Bundesliga has become the hotbed of young footballing talent and has created an environment in which young prospects can thrive in. Kolasinac is no different and he’ll be looking to put his stop-start end to the season behind him for the 2nd half of the season. Who is he? 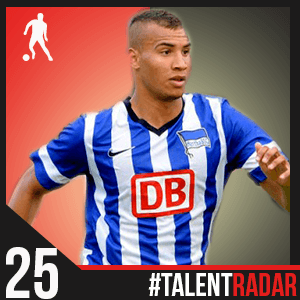 Our 2nd consecutive entry from the Bundesliga, John Anthony Brooks plays for Hertha Berlin. A centre-back by trade, Brooks was eligible for both Germany and USA and appeared at junior levels for both sides before playing for USA at senior level. Back in 2013: Hertha were in the second division of Germany the previous season before securing promotion to the Bundesliga in the current one. An important component of the promotion campaign was centre back Brooks. He was first choice defender for the club and featured heavily throughout the 2012-13 season. The 2013-14 season hasn’t been as smooth for him. It started off on a bright note with a goal in Hertha’s thumping 6-1 win over Eintracht Frankfurt. However since then injuries have affected the youngster’s season with him featuring only twice in the last 3 months of the calendar year. Having decided to represent USA in Internationals, Brooks made his debut in August and has to his caps by playing another 90 minutes against Austria. Looking at 2014: After a frustrating end to the year, Brooks would have enjoyed the timing of the winter break. A return to regular football would be welcome for the USA International as Hertha make the push towards European football next season. Who is he? The wonderfully named Dimitri Foulquier is a full-back who plays for Rennes and is currently on loan to Spanish side Granada. The youngster is a part of the French U-21 set up. Back in 2013: Foulquier spent the first part of the year at parent club Rennes. He often played in strings of games at a time and not a sustained run. However, he did play 5 games in a row towards the end of the season. The youngster was loaned to Granada for the season but understandably didn’t feature in the club’s line up at the start of the season given his exploits at the U-20 World Cup but his services were called upon on a fairly regular basis thereafter. His ability to play on both sides of the pitch has served both him and Granada well in the 11 appearances he’s made so far. 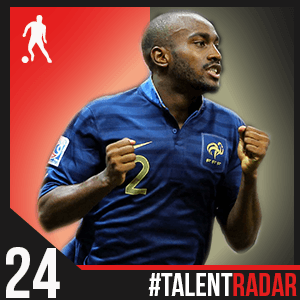 He played every minute of France’s U-20 World Cup winning campaign chalking up an impressive 3 assists. He has also played every minute of the qualifiers for the U-21 team so far. Looking at 2014: The more football a young player can play, the better his chance of making it at a senior level. Thus, in terms of playing time Foulquier can be more than happy to see out his loan move at Granada. We’ll be very interested to see what role he plays at Rennes next season. Who is he? Uros Spajic is a Serbian U-21 International. 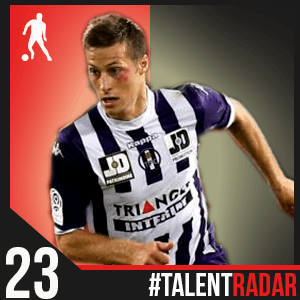 The 20 year-old centre-back plays for Toulouse in France. Back in 2013: The first half of 2013 was the last season in which Spajic represented Red Star Belgrade. He was a constant fixture after the winter break and impressed Toulouse enough for them to bring him to France in the summer. His debut for his new side was ended in bizarre circumstances as he was asked to leave the field as he was mistaken to be the teammate sent off by the referee. However, he has kicked on and started all but 1 of the league games thus far this season proving to be well worth the money spent on him in the summer. He scored his first goal for the club in the Coupe de la Ligue against Marseille. He’s a regular starter for the Serbian U-21 side featuring in all 5 of their qualification games in the year. Looking at 2014: The Serbian has settled in well to life in France and will look to kick on in the second half of the season. In terms of the national side, having featured regularly for the U-21s, the next step up is obviously the senior team- a feat much easier said than done given the wealth of options at their disposal. Who is he? Eric Dier is somewhat of a rare commodity in present day football; an England youth International playing football outside England. The 19 year old centre-back plays for Sporting Lisbon. Back in 2013: Having come through the ranks at Sporting, Dier has progressed to the senior side in Portugal. Dier’s versatility has come of good use as he’s capable at right-back, centre-back and central midfield, the last of which he portrayed in a run of games near the end of the 2012-13 campaign. Opportunities haven’t been that free flowing this season, with Dier starting 5 times this season and making a further 2 appearances off the bench despite being in the squad for all 14 of the games thus far. He was a part of the England squad for the U-20 World Cup in the summer and played every minute of the admittedly short campaign. He’s part of the U-21 set up and started the qualifier against San Marino in a 4-0 win. Looking at 2014: The Primeira Liga is wonderfully poised heading into the new year and Dier will be hoping to play a role in the second half of the campaign. As for his international career, he has to first and foremost force his way into Southgate’s first team before aiming for anything higher. Who is he? 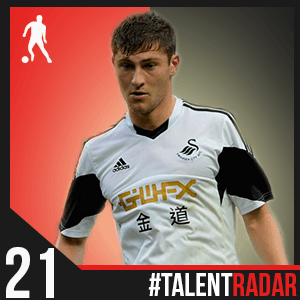 Ben Davies is a 20 year old left back who plays for Swansea City. He’s already a full Welsh International. Back in 2013: 2012-13 turned out to be the breakthrough season for Davies as he more than ably filled in at both club and country level for the injured Neil Taylor. Davies established himself as first choice left back and even scored his first goal for the club against Stoke. Taylor hasn’t managed to displace Davies from the starting line-up as he’s started 17 of the 18 league games thus far in the campaign scoring twice to add to his credentials as a developing full back. He made his senior debut against Scotland in 2012 and continued to start at left back for Wales in 2013. Looking at 2014: He’s done well to keep Neil Taylor out of the starting line-up thus far and there’s no reason he cannot continue to do so in 2014, both for club and country. There’s bound to be speculation linking him to bigger teams.